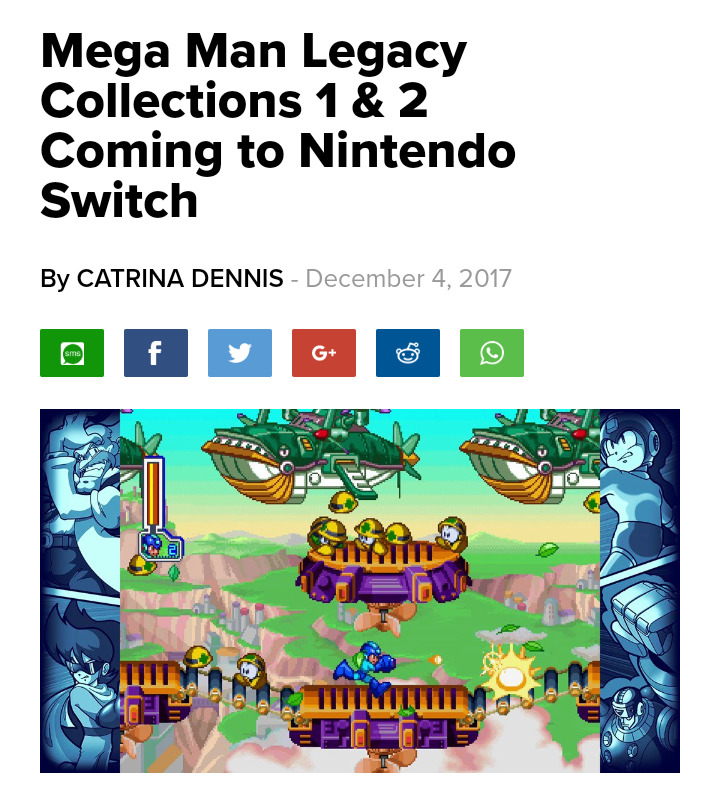 Capcom is bringing both Mega Man Legacy Collections to Switch, it has been confirmed. The two collections contain many classic titles in the series and will also feature amiibo support. 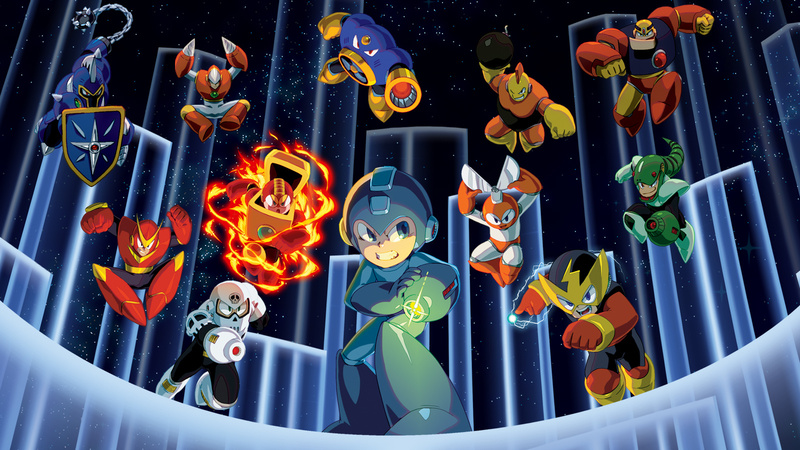 Between them they'll feature every numbered Mega Man game, including one never previously playable on Nintendo hardware. The news was revealed during a special 30th anniversary livestream. The first Mega Man Legacy Collection was released on 3DS. Seriously, what is happening at Capcom!? This is just insane! People will like to hear that. Never've been too much of a MegaMan fan so this only earns a "Buy later with a discount" from me. You have to give it to Capcom, they came through with the goods. Continued third party support is always welcome! Really glad these are coming. While I don't particularly need the first collection, I'll buy it anyway, and I'm really excited to see the second collection on Switch. I've wanted to play 9 and 10 portably since I first tried playing them on my Vita via remote play (a miserable experience for me, unfortunately). It's like someone throw away the trash of yesterday and is cleaning up the mess for today and I'm glad they did. Ports, remakes, and a new game all in one show, good job Capcom. "Will it be physical?" is a big question to me. I have Collection 1 on 3DS and I'd get a physical Collection 2 to get 9 and 10. I already have them downloaded on my Wii. @Grandpa_Pixel It's honestly rather shocking after we got snubbed earlier this year. But this might be the start of a great partnership going forward. Wow. Bout time. I’m buying. Good news all around. Mega Man is back! @ACK They're ports. If you thought Capcom would make a neat new box that truly contains both games, I've got some bad news to tell you on the Resident Evil Revelations Collection. Awesome news. Finally I can play all the classic Mega Man games in 1 place. I really wanted a physical collection of both, but between this and a new Mega Man game, I'm more than satisfied. 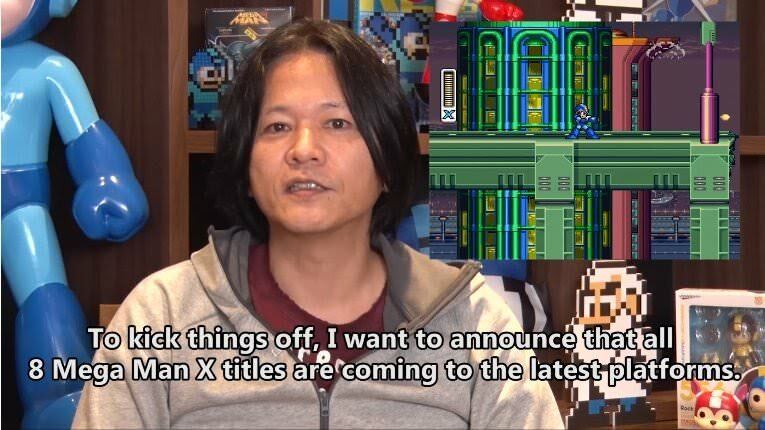 Mega Man 11, Mega Man Legacy Collection 1 and 2, and Mega Man X-X8 all coming to Switch, HOLY CRAP, MY HEART. Heyyy there ya go Capcom!! That wasn’t so hard now was it? Now how bout the Disney afternoon Collection next?? Would be nice if they bundled them together into one collection, and added additional emulation features like REWIND please! Question... Do these games (the Legacy Collection specifically) contain save states and / or rewind functions? I admit I am not skilled enough to beat these alone and would love to be able to "cheat" a little to try and beat them all! I had very low expectations for Capcom, they had nowhere to go but up....and up they did go. Quite surprised by this. Oh my god I cannot wait for these, Mega Man 2 is still one of my favourite games and then 11 as well, never really got into the X series the latter of which weren't very good but classic Mega Man is awesome. Capcom are coming back 😉, now Konami how about Castlevania? And now the Disney collection please. @Dayton311 MMLC 1 does have save states. MMLC2 doesn't exactly, it has designated save points instead (outside of the old save system). Damn, and I was just getting used to typing "Crapcom Strikes Again" all the time. What the heck am I supposed to do now with all that extra time? I would have preferred the Disney Collection but this is good news! 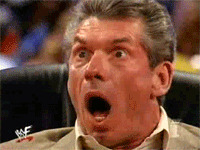 @ThanosReXXX We can still complain about Konami. But seriously, I'm glad that they're finally onboard with the Switch! Mega Man is back, baby! @Caryslan Eh, Super Bomberman R is much better now than it was back at launch. Hopefully they will have fixed the problems with Megaman 5 on the 1st legacy collection it was glitchy and didn't run well at all. @ACK Is this confirmed? I hope it's a single package, especially seeing how it's coming to the system much later than other versions. Either way, after all the announcements today, I'm really not complaining about Capcom for once. This day is a dream come true for me! @ThanosReXXX We can complain about Square Enix barely giving the Switch any feasible support. @StephenYap3 I'll have to disagree with you there as Octopath Traveller is still one of my most anticipated Switch games right now, and I Am Setsuna is pretty keen as well. They're even talking about wanting to get FF15 on there, and yeah it's the 'mobile' version, but that full version was never going to play on a Switch. Yeah... but we are really waiting for Resident Evil 4 HD and Resident Evil 7, aren't we? I've been a gamer for all of my life and I still have yet to play a Mega Man game. I'm excited to finally get into it with these collections! @DrRandle Square Enix better port the original version of FFXV or not bother at all. That mobile version looks crappy. @wiggleronacid I have played a bit of the early Megaman games, but I have never completed a single level. I found them very hard to beat. But since I have already beaten Shovel Knight, I think I can give the Megaman games another go. @StephenYap3 Ah, yes. That one too. Might as well throw EA and Activision in there with them. @cowntsikin Same here. I think I always preferred the simplicity of Mario games but I've played so many other 2D platformers now that there is no reason for me to not go back and enjoy these titles now. @DrRandle Has it been confirmed that it will be based on the mobile version? @GameOtaku If I recall correctly, MM5 was on the 1st collection was actually a true representation of it and that's (sadly) how it ran on the NES. Yes. One thousand times YES!!!! I love this series and i will lost definitley be getting these on my beloved switch!!! Now lets hope they give us physical copies for all this!!!!! Also wheres the article about the X Series coming to switch as well??? I mean i prefer classic mega man but i do enjoy the X series! This is amazing! I could have seen these coming eventually but I'm so glad it's actually happening. i'll take what i can get capcom! thanks! @MagnaRoader Now with amiibo function where all the undead wear Mario hats! While we're talking about the X releases, how's it being done? 1 Collection, 2 or more, or all individually? Well well, well, with this and 11 it seems like the original option to have the first Legacy with the Virtual Console version of 7 (pardon, VII) is back with a vengeance: eleven games instead of seven on the same console. Count me interested, despite my skepticism in the MM11 article. Sweet! Better late than never, I'm definitely gonna be getting both of these. I just hope they'll actually be coming retail over here in Europe this time, the 3DS version for Legacy Collection 1 was eShop only over here... also wonder what the amiibo support will be like. Though I don't really expect a whole lot honestly. @GameOtaku I just realized who you are. Forget I said anything. Look just check it out on VC then compare to the legacy collection version or just go over to gamefaq where it's also discussed and could be one of the reasons it didn't sell very well. Not sure how much more good news I can handle today. Its a start Capcom. Its a start. @Angelic_Lapras_King I was wondering this myself. The original series has an easy split point with the NES series and then the rest of the series (though it would be more balanced if they included MM&B in the 2nd collection). The X series really doesn't since the midway point is in the middle of the Playstation trilogy and those should be all on the same collection. It'd be dumb to split at say, X5, so you'd have to split it X1-X3 & X4-X8 or X1-X6 & X7-X8. Either way it's a wonky split. I hope they just put them all together in one package. I have to say bravo on this one. All of the classic and X games, and then Mega Man 11?! I think they get this time. So Capcom better late than never is righting some wrongs eh? MML1 was chunky, so that should be fixed. MML2 got screwed out of despite the superior sales of the 3DS release, so that's fixed. And then MM11 as well eh? Total Mega Man (classic numbered) compilation back on Nintendo start to finish. Physical though?? @subpopz How does it feel having the most appropriate avatar in this comment section? Nice. MMLC2 skipping 3DS and even Wii U was bizarre so In glad they're offering it to Nintendo owners now. Oh this is good news for Nintendo all right. I'll pick these up once Nintendo release a joy con with a D-Pad. "IT'S RAINING MEN! HALLELUJAH IT'S RAINING MEN..."
I think most were expecting this, tbh. Capcom must be getting a bit wobbly by now with all of the "port" they're churning out. I already got legacy 1 on 3ds for a discount. And I didn’t think legacy 2 was coming to Switch, so I already bought it on Steam a couple months ago. Would have been nice if they told us about this sooner, I would have waited. I might still get it, but it can’t cost any more than what I got it for on Steam. Capcom, you have earned my respect on this day. Big time. Well done. @DrRandle Octopath Traveler demo was pretty good and I am enjoying Spelunker Party so far. Everything else, such as I Am Setsuna and the possibility of FFXV Mobile on Switch, interests me little. As a huge fan of old-school JRPGs, I Am Setsuna doesn't look good enough for me to dive into (at least, not until it drops to around probably $10) and while being a mild fan of FF back in the day, I can't even look at the series anymore now after FFX (the last decent FF). Therefore, I can't support FF in its current state. The only Square Enix games that I am hyped for on Switch are both of the Dragon Quest Builders games, but even those two aren't enough to prevent me from turning my head away from Square and as good the Octopath Traveler demo was, I didn't enjoy it enough to make plans on buying it, let alone preorder. Welp this is where I will be getting them then, I was holding out for just such an occasion like this! With all this Mega man love I am very happy right now! Monster Hunter and Okami next please! My wallet is waiting! @Dayton311 Lecagy Collection 1 on the 3ds definitely did and I'd assume it would be the same here. Woooo! Patience is a serious virtue in this case, and needless to say I'm glad I waited on buying the New 3DS's VC version of MM7 as now I could just own the Switch version (pseudo portable) of the remaining legacy half! I was also awaiting when MM9 and MM10 would be portable and this is close enough! Since I own the first 6 on 3DS VC, I will most likely not get the first Legacy Collection, but definitely the second one. Also, the word-of-mouth on the emulation isn't good either. I'm pretty pumped for all of these as I am a long time Mega Man fan. I was playing Mega Man since before I even knew how to play games properly. Just walking off the edges and dying constantly! 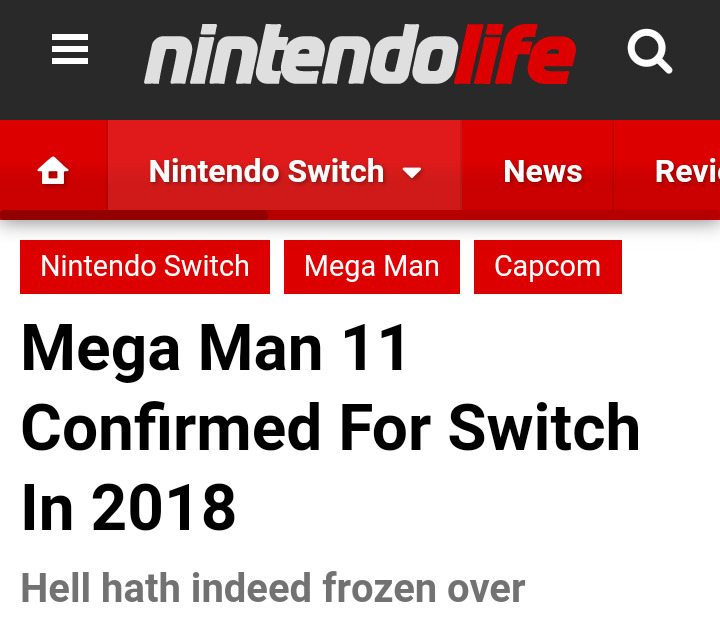 Being able to play almost the entire legacy of Mega Man on the Switch will be a great way to waste my 2018. Aww, no mention of Mega Man: The Power Battle or Mega Man 2: The Power Fighters which were included in past Mega Man Collections. And we have not yet seen Mega Man & Bass in any collection. Anyways, Mega Man 1 through 11 and Mega Man X 1 through 8 is still a TON of Mega Man to have on one system. No Gold Megaman amiibo, no sale. I'm buying everything on Switch (of course) day 1. Now I want Okami HD and MH World Portable. @VinnieMii Yeah, I have those Power Battle and Power Fighter games on the Gamecube Megaman collection, but playing any Megaman with a Gamecube controller is just awful, in my opinion. I never could get used to it. Those two, along with MM& Bass should have been on Legacy 2. I really hope these get physical releases eventually. Otherwise, I'll just purchase the X series when it goes on sale for a few bucks via Steam like the others. I'd be all over a retail release though. It wasn't that the GameCube controllers were unfitting, but they reversed the 'jump' and 'shoot' buttons on the MM Anniversary Collection which was a total [email protected]&k. They got it right on the MM X collection, though. 2013 was the year of Luigi......and 2018 will be the year of Mega Man, because Mega Man Mastermix will also release which no one mentioned. @StephenYap3 I mean, that's totally cool if you're not interested in the games, that's your bag. But that's different from "Square Enix doesn't support the Switch." They are totally on board supporting it, you're just not interested in what Square Enix as a publisher is doing these days. Again, totally fine, just a very stark difference. @NinNin Not necessarily, no. admittedly they've only talked about doing that port to Switch, no solid confirmations yet. But if the Switch was ever going to get any version of FF15, it was going to always be that one. @cowntsikin Not as crappy as the enormous downgrade the original version would receive in an attempt to wedge it into the Switch (and still probably have like a 50 gb download). It's a matter of reality with technical limits that prevents that version ever coming over. That's great news, but when do we get the Disney Afternoon Collection on Switch?